Regulation system for DIN bar (6 units) mounting. 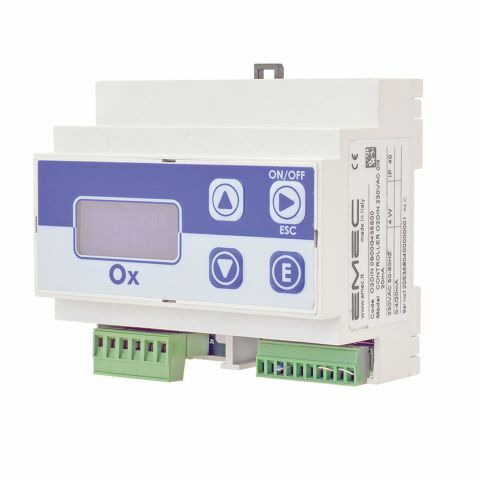 This instrument is normally used for water conditioning, allowing at once to regulate two on/off output and a current output for a connection to a chart recorder or dosing pump. An LCD display shows the working values and a simple keypad enables you to program these instruments. Probes not included. Remote control for flow sensor. Output current (galvanic release) 0÷20 mA or 4÷20 mA proportional to parameter read and programmable for minimum / maximum parameters values. Programmable delay at startup for probe polarization. Probe reading can be viewed instantly. Delayed output activation in line with set values for each setpoint being reached. Multiple connection modes for a single flow sensor. Remote control for output enable/disable.